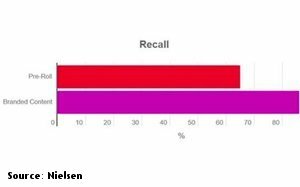 Digital branded content has better recall than pre-roll advertising, reports a Nielsen study. Nielsen analysis says branded content generated an average of 86% brand recall among viewers, compared with 65% from the pre-roll ad. Examples include 2016 Webby winner AirBNB: Love Is Welcome Here and Jimmy Fallon's teaming with GE. In addition, the lift in brand perceptions was higher for branded content than pre-roll across other key performance indicators -- affinity, purchase intent and recommendation intent. For example, affinity for branded entertainment averages 28% and 18% for pre-roll; purchase intent, 14% for branded content; 11% for pre-roll; and recommendation intent score 20% for branded content and 16% for pre-roll. Nielsen also notes branded content impact on future TV-video episodes is positive -- a 40% score for those who will “probably will” or “definitely will” when it comes to intent to view. Brand content marketers that work with publishers in a partnership saw a brand lift that was 50% higher on average than those marketers that distributed branded content on their own. Nielsen analysis came from consumer reactions to more than 100 pieces of branded content.